What’s more likely — that the universe will expand forever, or that it will contract in a big crunch, causing the end of the cosmos? - Mushahid, age 16, Chitral, Pakistan. About a century ago, we didn’t even know that galaxies existed. Then, in the 1910s, astronomers figured out how to measure the distance to features called “spiral nebulae” they were seeing in the sky. Although these looked like clouds of gas nearby to us, the scientists realized they were whole galaxies containing billions of stars, really far away. 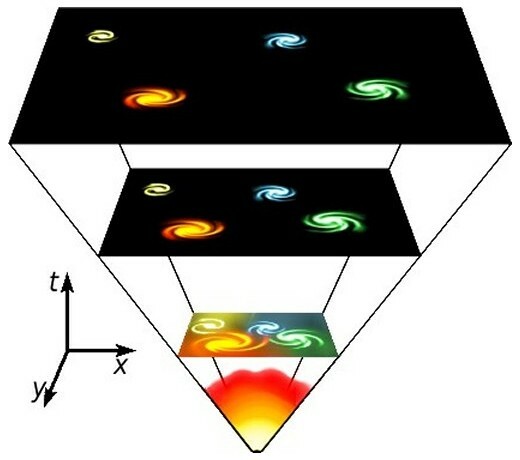 Pretty much as soon as we understood what galaxies were, we discovered that they are all moving away from each other, and the ones that are further away are moving faster — in other words, the universe is expanding. The expansion of the universe is everywhere — all points are moving away from each other. Ever since then, the question has been: will the universe expand forever, or will it one day recollapse in a “big crunch”? There’s a reason this was a puzzle; it’s because gravity should be slowing down the expansion. All the galaxies pull on each other in the same way that the Earth pulls on us and brings us back down when we jump. When I throw a ball up into the air, initially it may be going fast, but then it slows down, stops going up, and falls back to Earth. However, if I throw it fast enough so it’s traveling at more than 11 kilometers per second (that’s very fast! ), then it will never come back to Earth. It will have what’s called the “escape velocity” — this is the speed at which Earth’s gravity will not be strong enough to pull it back down. If I was on the moon, it gets even easier because the mass of the moon is smaller: It’s almost 100 times lighter than Earth. That means the force due to gravity there is less, and therefore I could throw the ball much more slowly, and it would still escape the moon’s gravity. Just over 2 kilometers per second would do it. So the question becomes: How heavy are all the galaxies, and are they moving fast enough away from each other to have the escape velocity? If so, the universe would expand forever. After the Big Bang (shown at bottom), everything expanded away from everything else. We had to wait until the 1990s when measurements became precise enough to figure out the answer. And the answer came as a big surprise. When astronomers finally measured how the expansion was changing, they discovered that gravity wasn’t actually slowing it down at all. In fact, the expansion was speeding up! That’s sort of crazy, because it means that gravity is working in reverse: something is pushing the galaxies away from each other. It is as strange as if I threw a ball gently up in the air and watched it accelerate off into space. We don’t know what is causing the acceleration, but we give it the name dark energy. The galaxies will all keep getting further apart from each other, the universe will get colder and colder, and eventually, any galaxies beyond our local group will become so faint and distant that we won’t be able to see them at all — their light won’t even be able to reach us. There’s even a chance that the acceleration might get so extreme that it rips apart our own galaxy, and eventually even rips apart atoms… destroying us all. That would be called the “big rip.” Most likely, though, we’re headed for a big freeze. So the universe is going to last a very long time, but the future will be cold and dark. This article was originally published on The Conversation by Tamara Davis. Read the original article here.